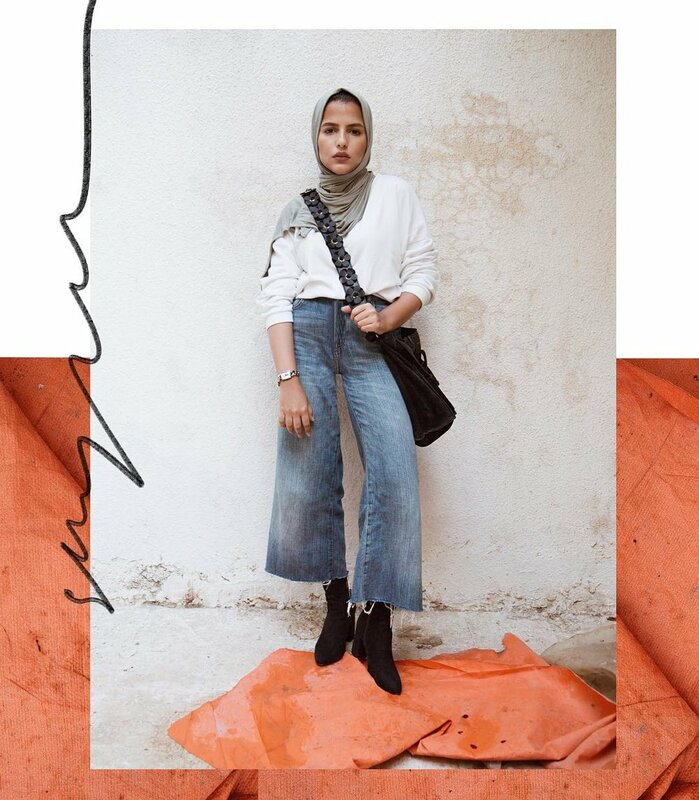 Our resident contributor in Amman, Jordan, takes us into the world of #hijabfashion, a commonly used hashtag for this burgeoning corner of the fashion world in which social media is a large part of the marketing strategy. In a tiny mall boutique, Rawan Besomi hangs her dreams. They’re all jackets, but these are far from plain blazers or dark winter coats. Fringe, sequins, tulle, feathers, embroidery, coins, puffy sleeves, and pointy shoulders all find places here. And color, lots of color. accounting, she began working as a school accountant. But when she found herself bored with the work, sketching jacket designs at her desk, and even making jackets in her off-hours, she knew something had to change. Jaketah, Besomi’s Amman-based brand, is trendy, funky, and handmade with love. Since the inception of her business three years ago, she’s worked with local tailors and imported fabric from places as diverse as Italy, Turkey, and the Arabian Gulf states, sometimes in her own suitcase. Fabric, she says, is always her first inspiration. Getting started as a fashion designer in Jordan is not easy. The biggest challenge? There are no fashion schools here—just a few courses within broader majors. Most Arab designers study in Europe or the U.S. and then work from Lebanon, Egypt, and the Gulf. that “hijab” refers to the headscarf only, the term actually encompasses much more. A woman who wears hijab must cover not only her hair, but also all of her body except her face and hands. As a designer, Besomi creates pieces for other women—referred to as hijabis—who wear hijab, pieces with long sleeves, high necklines, and lower hemlines. As far as style goes, Aya Barqawi couldn’t be more different than Besomi. The 22-year-old describes her style as minimal, clean, and editorial—and it’s caught the attention of 13,500 followers on Instagram, and counting. As an up-and-coming designer, Barqawi’s story exemplifies how Jordanian designers must be self-made. She loved do-it-yourself projects as a girl and would bore her friends by always wanting to do arts and crafts. Her first ventures into design came when she made doll clothes with scraps from her mom’s sewing projects. At the time of this interview, Barqawi was completing a degree in design and visual communication at the German Jordanian University and working on her senior project: a sustainable fashion line that springs from her understanding of “modest fashion,” a frequent hashtag on her Instagram account. Though Barqawi also wears hijab, she insists that modesty doesn’t require a headscarf. In her view, modesty is holistic, involving moderation and rejecting that which is extravagant, over the top, or wasteful. This idea is taking literal shape in her fashion collection, comprised of pieces that can be styled in several different ways. “You don’t have to be a Muslim to dress modestly,” she counters. Barqawi started wearing hijab when she was 15 or 16. It was a choice, she says, but it took time for her to understand its meaning for her. Now she considers her hijab an outward manifestation of her spirituality and relationship with God. That’s why it hurts when she receives hate on social media—because for her, wearing hijab is something sacred and personal. When she studied and interned as a fashion photographer in Germany for a year, Barqawi got mixed reactions about her headscarf. Some people assumed she was a refugee. Some knew nothing about hijabs but were open to learning. And then sometimes Barqawi just wanted to stay home to avoid negative comments and looks. Being back in Jordan doesn’t necessarily make things easier. Hijabis face criticism from within their communities, no matter where they land on the spectrum, she says. Those wearing all black are judged as extremists, and those wearing colors and having fun with their hijab are criticized as too free. Like Barqawi, Besomi put on hijab in high school, where 90 percent of her classmates and teachers were covered. It seemed a natural decision, a step toward growing up. Besomi loves to show others how they can be beautiful with their hijab, and is excited that some women have chosen to wear hijab because of her influence. She’s shared a variety of videos on YouTube, including one about basic ways to style your hijab. Wearing hijab doesn’t at all affect one’s intelligence or ability to fulfill her goals, Besomi points out. Somehow it makes outsiders think you have limited ideas, but that’s just not the truth. Barqawi’s fashion collection was launched in late January, and eventually she hopes to go to grad school abroad to hone her design skills. In the meantime, she plans to keep busy with freelance photography gigs and other design collaborations. As for Besomi, though her storefront is tiny, her brand, Jaketah, is growing, with two boutiques in Dubai now carrying her pieces. This year, she hopes to expand into Abu Dhabi and Kuwait, as well as open an online shop with international shipping. Even now, she is creating pieces for non-hijabis and branching out from jackets, though she says she’ll never leave her first love. She dreams of becoming a big name in fashion, going to shows in Paris and New York City, bringing her creations from the Middle East to the world. Heather Surls is a writer living in Amman, Jordan. After studying journalism and editing, she found her niche in creative nonfiction, which she uses to explore cultures and give voice to the voiceless, stereotyped, and marginalized. She loves walking, tea, Arabic, and a chatty blond boy and a tall, steady man. People-watching is one of her favorite things.